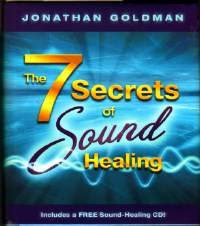 I just read 7 Secrets of Sound Healing by Jonathan Goldman. It is the best introduction to healing with sound that I have ever read, and it comes with a 26-minute CD of healing music composed by Goldman. The small hardback book is not much larger than the CD it contains, but it is about three-fourths of an inch thick and 161 pages long. It is beautifully designed. The book is printed entirely in Indigo ink on cream-colored paper. That is startling at first, but it is easy to read. And the dark, dark blue becomes a soothing element, contrasting with some startling ideas. 7 Secrets of Sound Healing is full of good information and experience from one of the pioneers of modern sound healing. Even without the CD it is worth the $17.95 list price. I bought it at Amazon.com, though, and paid only about $12.50. And the CD is lovely. Goldman was a rock musician until he decided about 25 years ago to pursue the possibilities of healing with sound. Since then he has founded the Sound Healers Association, has won Grammy Awards for his healing music CDs, and has authored several successful books on healing with sound. He has devoted his life to studying and teaching the use of sound for healing. This book not only explains the basic principles of healing with sound. It also debunks a lot of myths about sound healing, including some that Goldman himself believed in until research evidence and experience taught him otherwise. Although I will probably write more about this book in the future, I won't list the 7 Secrets right now. Each one takes a whole chapter to fully explain. I just wanted to let you know about it as soon as possible if you haven't read it already. This is by far the best book on Sound Healing that I've read. I highly recommend it. Whether you are just starting out or have been in the field awhile, I believe that you will find this book valuable. 7 Secrets of Sound Healing will make you think, and it may force you to reconsider everything you have been taught about healing with sound. And that could be a blessing in disguise: It could make you a much better healer. Please read the book, listen to the music, and let the rest of us know what you think. I fully agree with this review. 7 Secrets to Sound Healing is easy to understand and full of wisdom. I've gotten a very good introduction to sound healing through this book.